I had my Sophie’s choice moment the other day — the moment you have to choose one child over another. Actually I chose neither child and opted for the expensive and breakable purchase. When your child is “honored” with the invitation to play percussion in the band (there is a try-out and everything to make sure you feel sufficiently privileged) you automatically sign up for a number of expensive (and by the looks of them, noisy) items. Early on we procured all of the necessary mallets, practice pads, and music stands. I’m proud to say they have not, as of this writing, been used as projectiles at humans or pets in the Milhizer household. But, we knew we were in for the expense of a practice marimba, which as far as I can tell is in the same species as a xylophone, just $1000 more. Practice marimbas, in case you are not up on the current cost of a marimba, will run you about $1500. “Practice” is a misnomer. “Practice” implies something smaller and less expensive than the actual thing. There is no “practice” about this beast. It is the size of a small shetland pony. It is on wheels because of its size. And in the event of a zombie apocalypse, I have plans to fashion it into my getaway vehicle by attaching the leaf blower to the back. Come to think of it, I could have used it about 2 weeks ago when post-appendectomy, I seriously considered getting a walker with the tennis ball feet. Pushing around a marimba on wheels as an aid to standing would have made me look far less old, if no less ridiculous. Last week about 12 pre-precussionists’ parents began the search for that elusive species, the used marimba. I was ready to buy the new one and save myself the trouble. Eric couldn’t understand why anyone would buy a new marimba. He posited that there is a law of conservation of marimbas (or is it marimbae?). No one keeps a practice marimba. You don’t see them in people’s houses, other than perhaps as a fancy drying rack. And I’ve never seen one at the curb on trash day. Therefore, if in any given year there are x number of entering 6th grade marimbists, there must be an equivalent number of exiting marimbists on the other end jettisoning x marimbas. Eric hinted I may not be up to the shopping challenge. 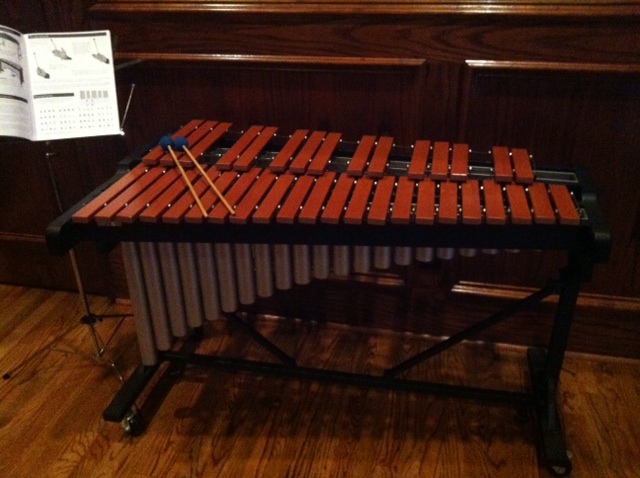 Resolute, I was crafty enough to find a used marimba in my own town at a reasonable price. I was there at the first opportunity, cash in hand. As I mentioned, the thing is huge and only comes apart into 3 enormous and inflexible parts. It actually doubles in size when deconstructed. It would not fit in the back of my car. I folded down one rear seat, promoting my 11-year-old to the front seat, invoking the “Marimba On Board” exclusion to the law that you must be 12 to ride shotgun. Or I could have tied the marimba to the bumper and dragged it home on its wheels. But there is a little known clause in the law of the Conservation of Marimbas, which states: Harm no Marimba. So there I stood with a marimba half hanging out of the back of my car, and no way to get it home; cursing and longing for the French Horn and all of its spittle accommodations. Finally the woman suggested she put it in her mini van (which she got to haul the marimba around. No one told me a mini van was a prerequisite for percussion. I guess I’m in for another $30k) and follow me home. The thing has now taken up residence in my office. It comes in handy. When I think a conference call has gone on too long, I give the ding-ding-dong universal signal to wrap it up. My youngest has already told me he wants to play the pan flute. Look out Zamfir! I can definitely fit that in my car. This entry was posted in Musings by blmilhizer. Bookmark the permalink. LOL!!! I have such a great mental image of your Zombie apocalypse vehicle! I think that should be a goal of all of your articles. …we cover all the letters of the alphabet! That should be a goal of all your articles. Actually, I think we can do without “vehicle” and still get it done!